My garden is growing things! And if it isn't exciting enough seeing the little fuzzy baby okra grow into big fuzzy edible okra, yesterday, I was able to take some as the first harvest from our garden! Now, I know that I like okra. But okra fresh from the garden? OMG, so sweet! 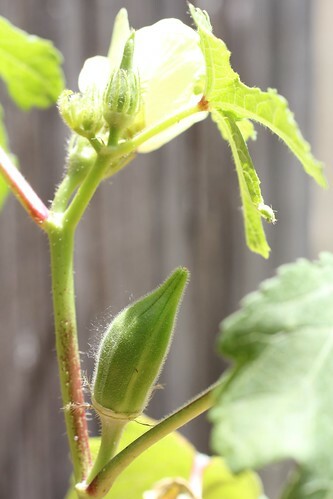 (As in, it tasted so sweet, not that it's sweet that my garden is growing okra... okay, though that is pretty cool, too.) I've never really been tempted to eat okra raw before but this stuff? Totally could. It's delicious. But instead of eating it raw, I had promised Dan that I'd try my hand at fried okra. Of course, since I can't have cornmeal (what you dust okra in for frying), we tried brown rice flour (it worked well when I fried some catfish). It turned out pretty darn tasty! Though it is a bit hard to tell when anything with brown rice flour is done because it doesn't exactly turn golden or anything. So I probably could have cooked it a minute longer, but hopefully I'll have lots more okra to experiment with this summer and I'll get the chance to perfect my timing. Also, because I found this guy hanging out around the okra, I thought it would be appropriate to share his picture on my okra-related post. It's a new visitor to my garden! Hopefully, I'll soon be able to post about the squash growing in my garden! I've never thought of eating it raw (too fuzzy) but after trying a bite of mine, I can see the attraction. So good! I will give the milk dredge a try - I just looked up the method in the Talk About Good! cookbook and they had just the dry stuff. Turned out nice, though!